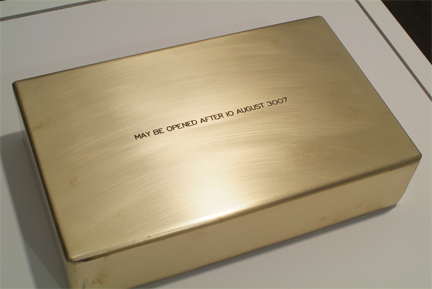 Conventional time capsules are sealed containers holding documents and objects meant to represent the present to the future, becoming messages of normativity from the past. These repositories are often buried in the ground or placed within exterior walls of buildings and labeled with a target date for future retrieval. But burial or exposure to harsh weather contradicts the stated objective of preservation and the selection of materials can never account for what may unfold in the intervening years, possibly becoming irrelevant or redundant to future generations. The contents of a time capsule opened ceremoniously at the University of Washington, Seattle, in 1999, were greeted with jeers and boos from disappointed unimpressed onlookers. The time capsule paradigm also places a premium on "change" and "progress," assuming that societies and cultures will alter significantly over time, warranting the gesture of preservation. This project questions these assumptions and their underlying contexts by deliberately playing some of these conventions against themselves. The project does not commemorate a particular event or site, the contents are not catalogued or disclosed prior to encapsulation, and rather than carrying an opening target-date the capsule is inscribed with a date after which it may be opened if the owner so wishes. The meanings of this project unfold in relation to the interpretation that the "capsule" receives during the duration before it may be opened; through the decision whether or not to open it; and finally in relation to the possible discovery of its contents.